Founded in 1997, Wetpaint has been in the industry for over 20 years. We are a new breed of Agency in the age of the connected consumer. With the blurring of channels and devices, the old siloed days have gone. Wetpaint works across all mediums without preference or prejudice, delivering strategy and execution via all channels that brings you closer to your target market than ever before. Where the ordinary is outdated and leading edge quality is the only grade that makes the cut. As brand mechanics, we love getting our hands dirty. We develop solutions to problems hindering performance, fix what is broken and ensure clients' brands are well-oiled running machines. Each boutique division brings its own unique offering to the collective. As a group of specialised, self-owned agencies run by experienced Directors all under one roof. 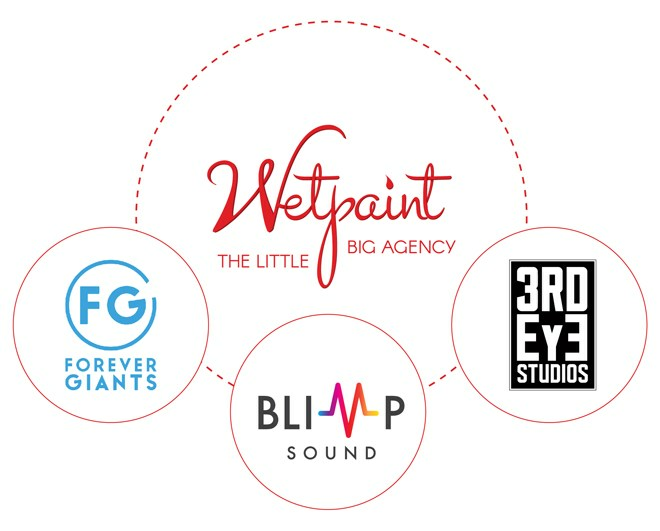 We are The Little Big Agency! Our strategists immerse themselves in the lives of your brand's potential users, uncovering their motivations and needs. Armed with these game-changing insights, they shape strategies with the power to radically shift behaviour. Our digital team strips out anything that does not improve performance. Our technical detail provides the means to operate at speed and scale. The result is always a simpler, smarter, faster solution that will outperform expectation. Wetpaint works across all mediums without preference or prejudice, delivering full service campaigns. Channels and services are chosen because they will yield the best ROI for the Client and accurately penetrate the target market. Through the line production services are handled in-house, ensuring quality, turnaround and management of any campaign is efficient and seamless. Why have multiple agencies when you only need one? Our in-house team communicates intricate concepts to broad audiences, young and old. They bring to life ideas that may be cost-prohibitive or even impossible with live-action. Our in-house engineers provide the perfect sound to fit your commercials, which is as important as the visuals accompanying it. From scripting to final track, including bespoke original scores are produced in our studio.